I was going to wait and post tomorrow, but it seems everyone wants more Swoon!! First, let me start by saying it was an incredible honor to quilt for Thelma of Cupcakes 'n Daisies. Thelma's blog was one of my most favorite blogs to read before I started mine, still is. I remember the very first email I sent Thelma asking for her advice. So it is incredibly awesome that I quilt for her now. Thelma is an amazing piecer. I swear her quilts were so flat, just like a sheet!! An absolute pleasure to quilt. Warning...lots-o-photos ahead. :-) Let me introduce Baby Swoon. I really had fun trying new quilt designs on this. More of a contemporary/whimsical style. I just love how the custom quilting looks on Swoon. Of course, I took photos along the way while I was quilting. Sometimes photos while the quilt is on the machine are my favorite because I can see the progress. I always love the backs nearly as much as the fronts of quilts! 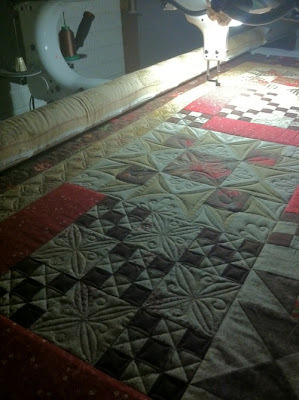 Let's see some of the specifics on this quilt...all the quilting is freehand. 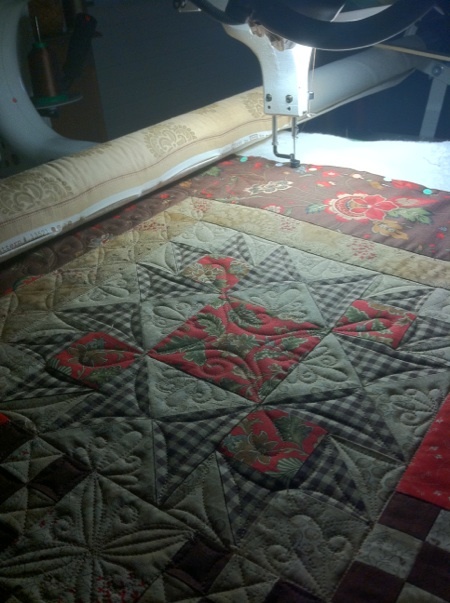 I used my ruler to do a lot of stitch in the ditch and straight line quilting. I used the white, Bleached Dream Cotton batting in the Select. It's the mid-loft. I LOVED it!! I wanted a white batting to really make the white as white as possible in the quilt. It was my first experience with this batting and I would gladly use it again! The pattern is Swoon by Camille Roskelley. The fabric is Carrie Nelson's Nine Dots. Just two thread changes in this quilt. I was a little nervous initially quilting for Thelma, but what I was most nervous about had nothing to do with the quilting...but the binding! I also did the binding. 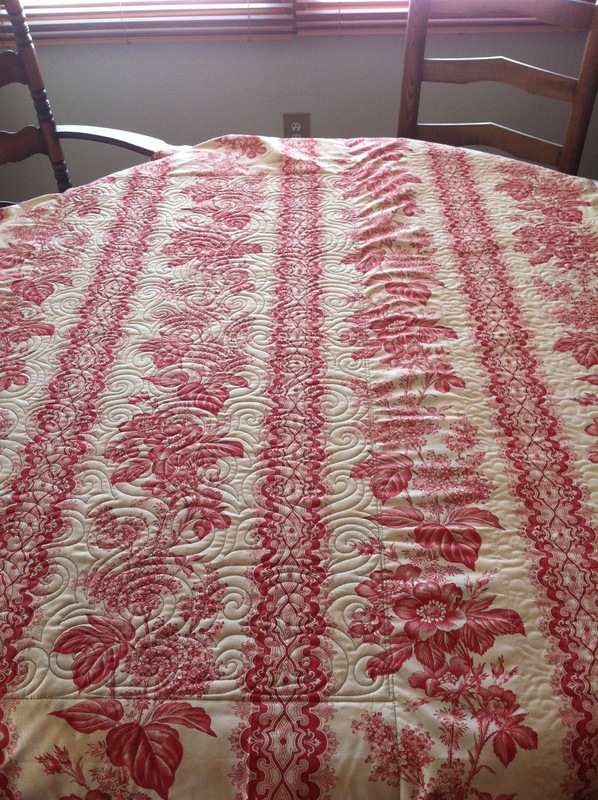 I know quilters like their binding done a certain way, so I did my best and held my breath. 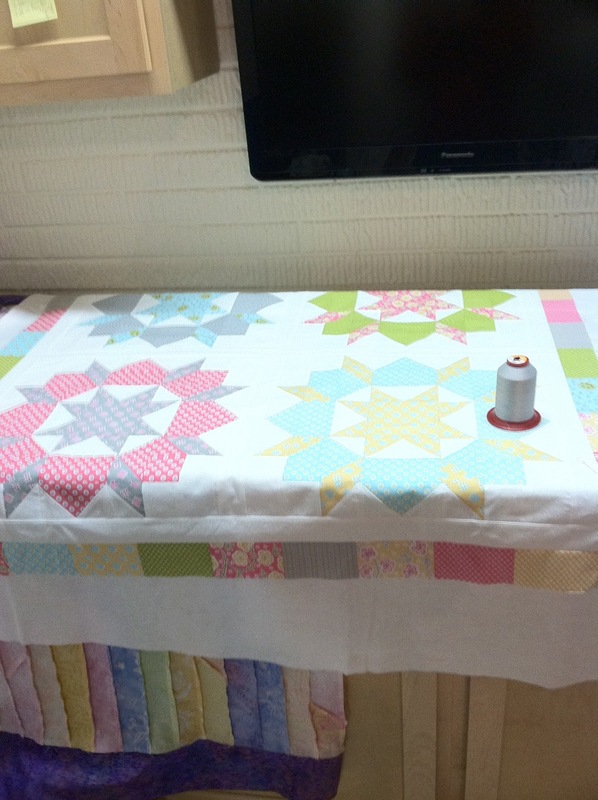 I apply binding with my regular sewing machine to the front of the quilt and hand stitch to the back. I haven't mastered the whole applying it with the longarm yet. I surely wasn't going to practice on this quilt!! LOL!!! Thankfully, Thelma loved the binding too. Thelma sent me the nicest email when she received her quilts. I was so moved by it that I actually printed it out and displayed in my studio! It's nice to have a little inspiration during those times of frustration...cuz I never have those. LOL!! Thank you, Thelma! It was really hard to send the quilts back, but when I could literally hear how thrilled Thelma was in her email, it made my whole day! 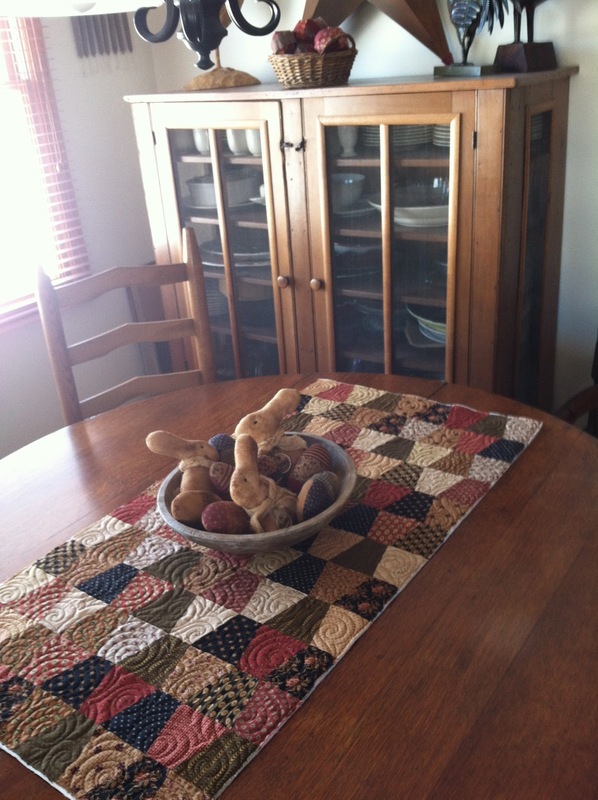 Make sure you stop by Thelma's blog to see her quilts at home. Say that post title 10 times fast. :-) I can't wait to reveal the rest of the quilt from my last post, but it just arrived home yesterday. Talk about snail mail!! It took nearly a week to ship 2 states away. I was starting to entertain awful thoughts that my client's quilts had gone to the wrong home. Well they did arrive yesterday and she was thrilled!!! So I'll get to show her quilts soon. I've been quilting up a storm. Trying my hardest to play catch up yet again. :-) So far I've finished quilting 6 quilts this month. That's almost a world record for me!!! 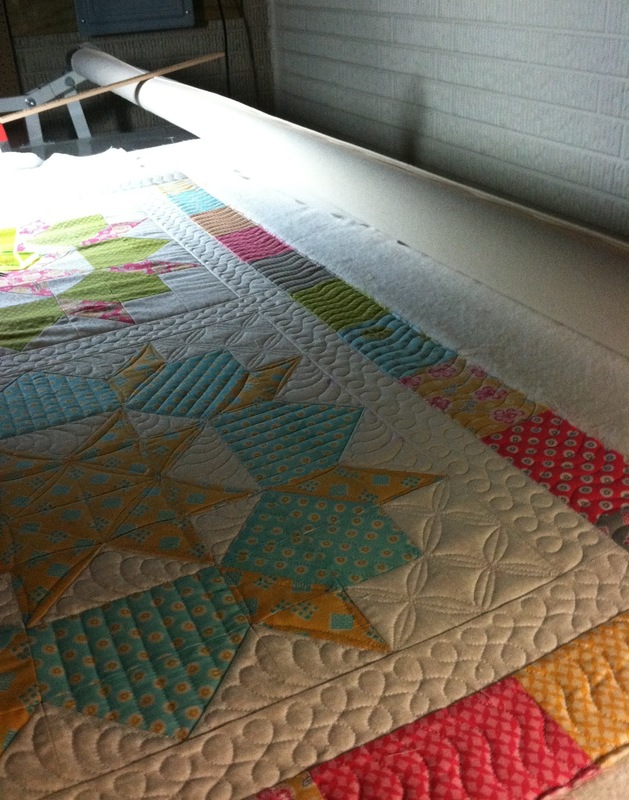 Luckily between custom jobs, I had some all over quilt jobs I could sneak in. Speaking of sneaking in...I was able to sneak in couple of my own very small top to be quilted as well. I figure when it's 12:30 in the morning, that's on my time and I can put a quick project of my own on the machine without feeling guilty. No custom quilting on my own stuff, no binding yet either, but that's ok with me! I'm just thrilled to enjoy some of my things. I tell you, it re-energized me to quilt a few of my own!! I quilted up this gorgeous mini tumbler runner. 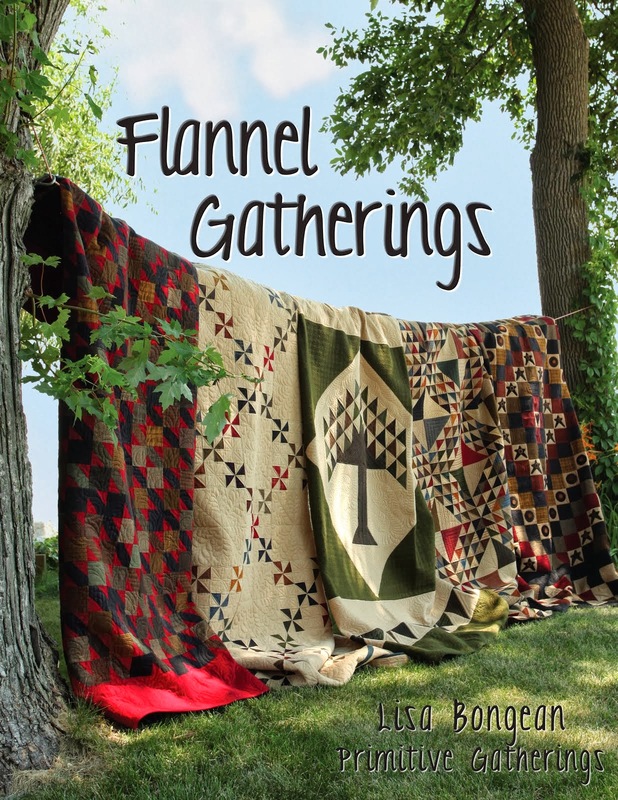 I picked up this kit at the Quilter's General Store in Rockford Illinois last November on our way to Primitive Gatherings. The kit was an awesome deal. It included the 3" tumblers, backing and binding fabric. If you order it online here, it includes shipping too!! Quilter's General Store is an AWESOME shop if you are in the area, even if you are not, it's worth it to go. There are some amazing shops all in a relatively short distance of one another, so you could make it a great day trip! It's the first time I tried quilting nested swirls like this. I LOVE it!!!!! I will quilt them again. Went fast and I love the texture. My inspiration came from Judi aka the Green Fairy. Judi has mentioned how she likes to quilt swirls because it works for everything. She was RIGHT!!! I decided not to go with the backing in the kit. Not because I didn't like it but because I needed a larger backing. 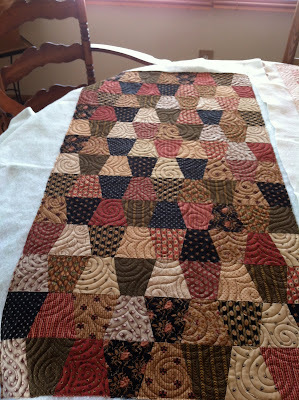 I actually quilted another little runner at the same time, on the same backing. What a time saver. I'll show you that runner soon. :-) The backing I used worked perfect for both quilts and it's so pretty, it easily could be reversible. I kept this side up for Valentine's Day. I believe the backing is from a past 3 Sisters Christmas line. I love a reversible quilt!!! I also tried a new batting out of my sampler box from Dream battings. It was the Green batting. 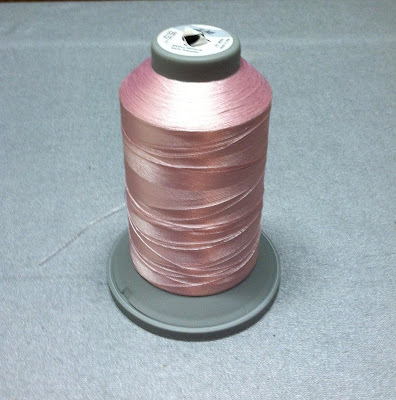 It's made from recycled materials and is a poly batt. I LOVED it. LOVE, LOVE LOVED it. Was so surprised how much. It is soooooo soft and pliable. More so than the regular Dream Poly. 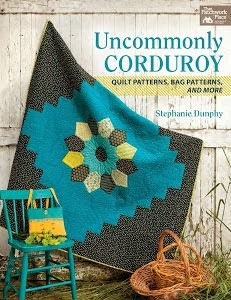 It quilted up beautifully!!!!! The stitches just melted beautifully into the fabric. 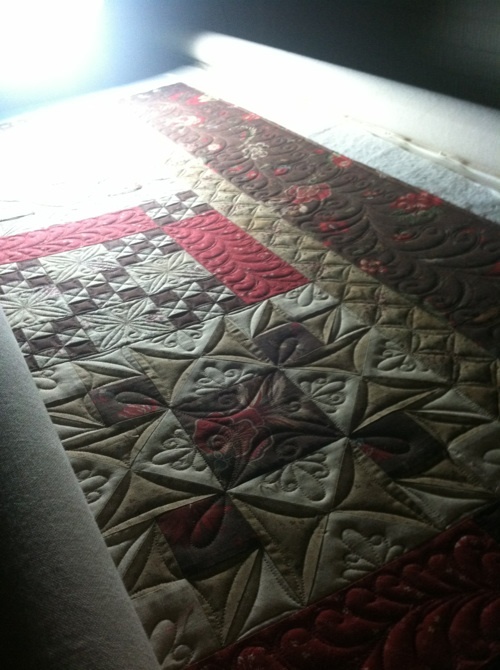 You could see the texture of the quilting. It didn't flatten out at all. I will be ordering this to have on hand for another batting option. I will use this in my own quilts for sure. I love it like I love wool batting!!! AND it's a fraction of the cost of wool. Happy Valentine's day!! I thought I would write a quick post because I am trying to finish up some bindings on client quilts. I thought I would share a Valentine themed quilt that I quilted for my client Mary. 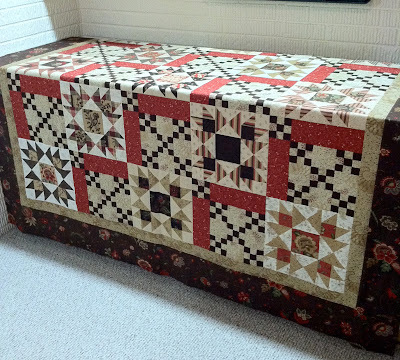 I quilted it last Fall. Remember, I'm still playing catch up on some show and tell. Mary made it for her daughter. I believe she said she used a Jelly Roll and some yardage. Turned out beautiful!! Very sweet! The lighting wasn't great the day I took it off the frame, so the majority of the photos I'm sharing are while the quilt was still on the machine. I have quilted several quilts for Mary, so she pretty much trusts my judgement on the quilting at this point. She did express she wanted some custom quilting though. It's all freemotion. I did some continuous curve, swirls and swirls which formed a kind of heart motif in the open areas of the Irish Chain. The back looks so pretty too. 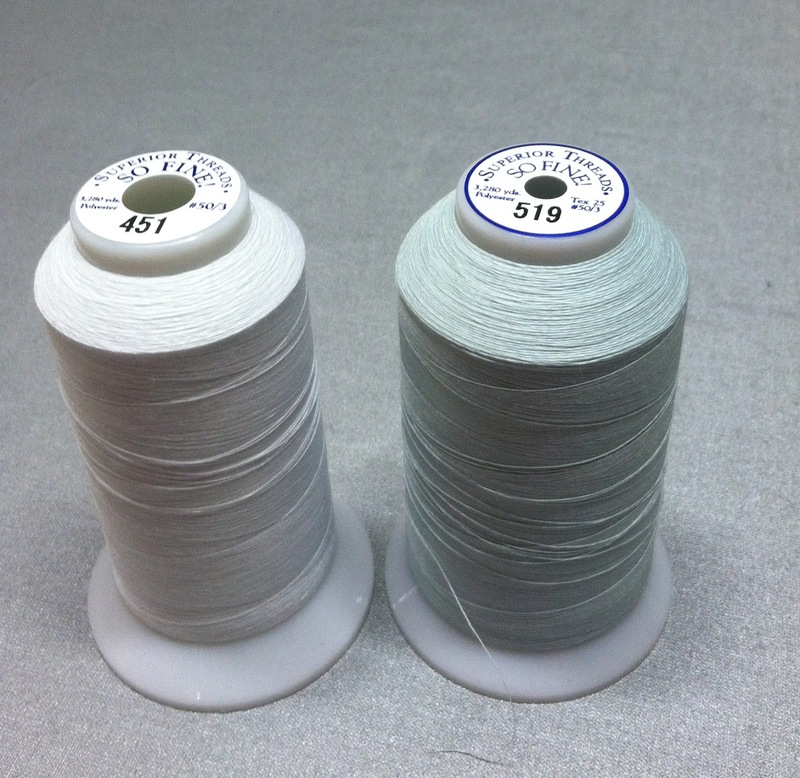 Mary provided some Request Dream Cotton batting, which is the thinnest loft. I had enough to double batt, so that's what I did. I worried it would be too thin and it might be more difficult to get consistent tension. It worked beautifully. I am so glad I doubled up on the batting. I will be giving a little batting review soon as I have been able to sample some. 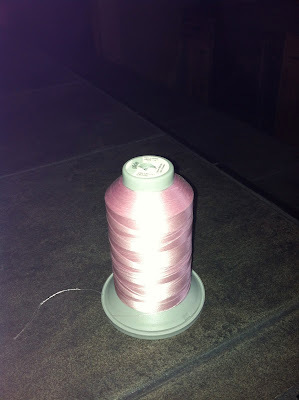 I used the prettiest shade of Pink Glide thread top and bobbin. It was perfect. 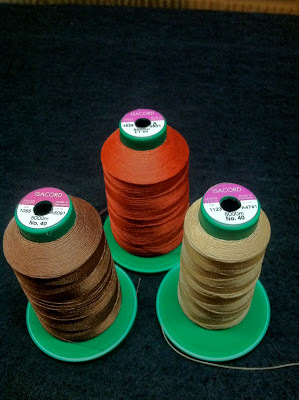 Glide is a great name for this thread because it really does just Glide through the machine and the quilt. Like butter! As I have mentioned before, there is some sheen on this thread but on the right quilt, it's gorgeous. I took a photo with flash on so you could see the sheen. It looks like a metallic thread! Pretty!! Mary was delighted with her quilt! Has anyone been having Blogger issues? I received a few emails yesterday from readers stating they couldn't leave comments. I have also had issues leaving comments on blogs as well. Not sure what the deal is?? I've picked up some new goodies to decorate with recently. I love adding a few new things here and there. It just gives the house a bit of a new look. I know it's not Easter yet, but I couldn't pass these up. Little bunnies and grubby eggs! 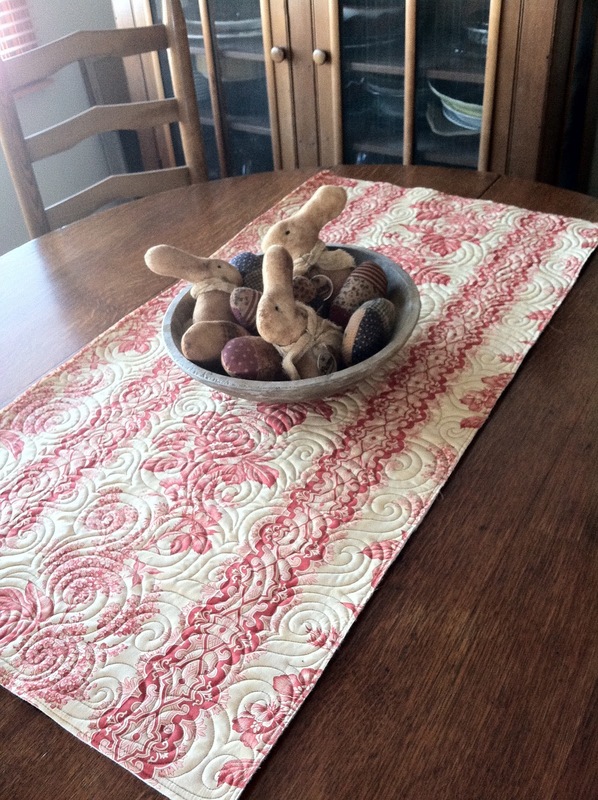 I recently discovered a fabulous new primitive selling blog called KKL Primitives Selling Blog. Denise, the artist, is super talented!! She has the sweetest homemade goods!! I could almost eat the bunnies! They smell just like a cinnamon bun because they are rubbed with cinnamon for a gorgeous patina. I also picked up this darling stitchery. Just made my heart melt! It came with the primitive black frame too. I just love it!!! I've picked up a few things from my favorite little prim shop in Shipshewana called A Thankful Heart. I had a gift certificate burning in my pocket from Christmas. I picked up a couple of prim trees and a new house. They currently are decorating the top of our entertainment center. I looked at the trees last fall, but scored them and the red school house half off during their sale! I also picked up a gorgeous quilt shelf. Not on sale. I still need to find the perfect place to hang it. My friend Patti made me the sweetest Christmas present. She painted a little Shaker box and stitched a wool flower on top! I love it!!! Goes perfectly in my house. What a friend!! Well, that concludes my little tour. Hopefully, I'll get some of my Easter decor up this weekend to match my new little bunnies and eggs.